Renault hopes the sporty stance of the Wind will win over male buyers. 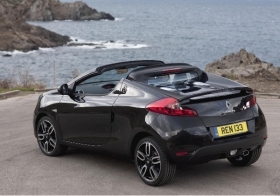 PLOERMEL, France -- Renault seeks to make inroads in the European subcompact convertible market with the launch of the Wind convertible. The Peugeot 207 CC is the Wind's main rival, Renault Product Manager Fleuryse Girot said. But while most Peugeot 207 CC drivers are female, Renault says it hopes the Wind's design will appeal to both sexes. “We are aware that most Peugeot 207 CC owners are women, so we wanted to design something that appealed to female demographics with a sleek style but with a sporty look as well and good driving performance for men,” Girot said. The main target group for the car is men and women between 25 and 45 years old for whom “fun-driving” is important, Renault says. The automaker hopes to capitalize on the popularity of small convertibles in Europe. It expects Europeans to buy 100,000 such cars this year, rising to 150,000 annual sales by the end of 2011 depending on economic conditions. Girot said the Wind is not a sports car but is sold as a “coupe-roadster.” The car is technically a coupe, but also offers sports car-like driving performance and it has a cockpit-style design. Sporty design features include the integrated headrests, the tunnel-shaped enclosures around the console controls, and the low position of the seats, which are just 51cm (20 inches) off the ground. Renault Sport Technologies division designed the Wind. A key selling point for the Wind is the electrically operated hardtop roof, which opens and folds in 12 seconds. Renault said this is the second-fastest time among all convertibles on the market after the Ferrari 575 Superamerica's roof system, which has a similar design. The rotating roof weighs just 21.8kg, which Renault says helps to keep the weight of the Wind to 1,173kg (about 2586 pounds) or lower, depending on the engine version. The Wind has a similar folding roof to the Ferrari Superamerica. Main competitor: Peugeot 207 CC. Base price: 17,500 euros (France). Best bits: The Wind provides the same 270 liters of luggage space whether the roof is open or closed. To maintain a high degree of stiffness to compensate for the low weight, Renault added strengthening bars below and between the interior and trunk. Girot would not disclose production plans or sales projections for the Wind, which shares the same chassis as the Clio and is built at Renault's factory in Novo Mesto, Slovenia. However, she said that the Novo Mesto site has a total annual capacity of 200,000 units for its Wind, Clio and Twingo. The Wind is available with 133-hp 1.6-liter or 100-hp 1.2-liter gasoline engines. At 3830mm (about 151 inches), Renault says the Wind's length puts it between the Twingo (3600mm) and Clio (4030mm). France, Germany, and the UK will be the Wind's main markets.